Untitled, 2018, collage with paper pins mounted on aluminium, 55 x 46". The unorthodox genesis of these artworks is by now well-known. 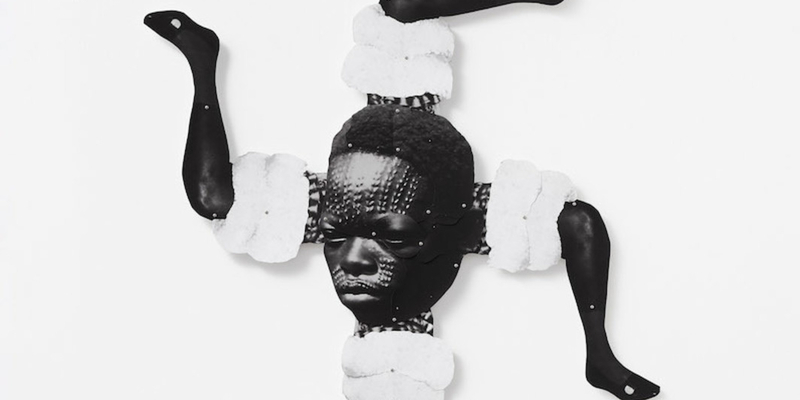 Frida Orupabo, at the time a professional social worker in Oslo with virtually no relationship to the art world, meticulously developed her personal Instagram feed into an extraordinary gallery of mostly found imagery that, through subversive digital collage, carves out a space of self-expression that complicates the othering gaze. Referencing a range of art and cultural history as wide as it is distinctive, the project caught the eye of Arthur Jafa, himself an avid found images enthusiast. The feed, still hosted by the @nemiepeba account, spurred him to invite Orupabo to take part in his 2017 show in London’s Serpentine Gallery. “Nemiepeba is a dancer,” Jafa wrote then of her feed, a “voluptuous trail of black continuity.” For “Medicine for a Nightmare,” her first institutional exhibition in Norway, she has invited him to show his celebrated 2016 video Love Is the Message, the Message Is Death alongside her own work. A series of Orupabo’s paper collages is juxtaposed with the original Instagram feed flickering across nine wall-mounted tablets (all works Untitled, 2018). Evoking paper puppets—bodies whose movements and destinies are for others to control—the collages depict men, women, and children reconstructed, pinned together with brass fasteners of office supply fame. Conspicuously, Orupabo outfits the figures in layered garments roughly scissored out from various photographs. Surrounded by ropes, knives, birds, corpses, and scenes from medical examinations, they make up a sinister whole. Orupabo, a Norwegian-Nigerian who grew up in a small town in southern Norway, frequently points to her experiences growing up as black in a white community when asked about her subject matter. Still listed on the staff pages of a resource center for victims of human trafficking and prostitution in Oslo, she has been selected for Ralph Rugoff’s Venice Biennale this summer. Clearly, her black-and-white imagery, and perhaps the surplus value of her unusual artistic trajectory, has struck a chord.